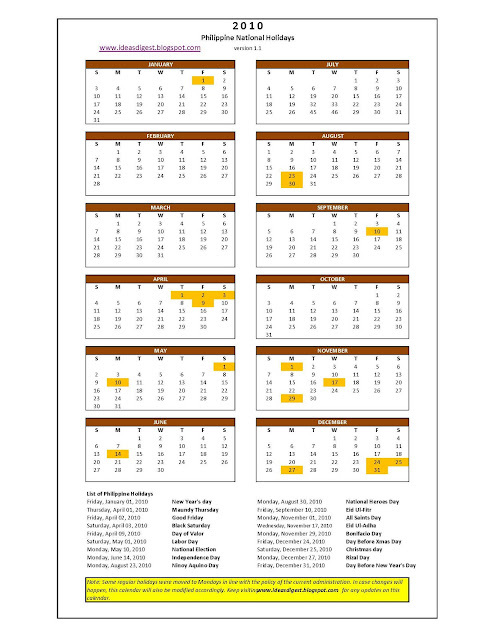 As a supplement to the list of holidays provided in the previous article, I have here a downloadable calendar for the year 2010. The holidays are shaded for easy distinction. Image via Wikipedia Planning ahead is a difficult job. For one simple reason…no knows the exact future! Yes, if you could only see few years from now or even just few days from now, then you can plan your activities well to maximize your benefit and avoid bad things that may happen. Image via Wikipedia Have you tried to transfer funds between two different banks in the Philippines? Well, most people do especially overseas Filipino workers (OFWs) on their remittances. How much does it cost you? In my case, when I transferred 600 pesos from my Union Bank (UBP) account to my BPI account through online banking, it took me three days before knowing that only 450 pesos reached my BPI account. My reaction was a feeling of slight stupidity. I just lost 25% of my deposited amount! From that moment on, I promised myself not to do that again (charge to experience). I will take the effort to personally do the transfer. But now, I think I have to break my promise in the coming year! Why? Because next year, Banko Sentral ng Pilipinas (BSP) in agreement with the Association of Bank Remittance Officers Inc. (ABROI) will lower the interbank transfer charges from the current rate of 100-550 pesos down to only 50 pesos. Image via CrunchBase AN EARLY NOTE: This is article is not against Craigslist but a warning to everyone that might encounter this type of scam on any other website like craigslist.org. Craigslist is one of the major advertising websites in the world. But just like any other network, it can also be infiltrated by scammers. Have you seen job post oncraigslist looking for writers who could write web content? We’ll if it is your talent to write, and you really enjoy, then this can be a good opportunity for you. You can earn extra money from these. You can be a freelance writer! I myself have tried and I got a payment of 2 dollars for each 400-word article on a particular subject. Well, I think I got the good one because I got paid but recently, there have been reports that there are job posters looking for content writers and to be able to apply for job, you have to submit…SAMPLE ARTICLES. Image via Wikipedia Are you looking for a job? Whether you like it here in the Philippines or outside abroad, it’s always good to have fast and credible sources of information about job vacancies and opportunities. So where are you getting the news? Probably the oldest method of trying to have the information about job vacancies is through friends and acquaintances. Though much slower than the modern web-based information dissemination, friendly referrals are still effective today. In fact, many people agree that they even trust more the information coming from a friend than in the newspaper and on the internet. "Imagine a world in which every single person on the planet has free access to the sum of all human knowledge. "Above is the banner statement I saw at Wikipedia. And I can’t deny the fact that Wikipedia has really done the big part in sharing tremendous amounts of knowledge through their user-edited free online encyclopedia. Wikipedia has been part of our lives indeed. Students, professionals, businessmen, and almost everyone who has an access to the internet have benefited to the free information it provides. Now, Wikipedia’s founder Jimmy Wales appeals to everyone. Due to the increasing cost of website maintenance and other costs that keep it going and growing, Wikipedia needs funds to keep it the way it is…an advertising free website whose mission is to contribute for mankind’s education. They are accepting donations of any amount. Image via Wikipedia As we get deeper into the information age where the cyber world is expanding ever faster, numerous opportunities to earn online abounds us. One of these opportunities is by making a KNOL. The immediate question that pops out is: what is a knol? As per Google’s definition, Knol is a unit of knowledge. It’s like shorthand for KNOLedge. Google Inc, worlds leading internet marketer, advertiser, search engine, etc has launched its new online service—Knol. Knol is Google's version of Wikipedia. We’ll I think I don’t have to go further about Wikipedia. In simple terms, Knol, like Wikipedia, is a user-generated free online encyclopedia. How can I join Knol? The simplest way is to sign-up using your Google account. I’m not so sure if you can use other email accounts. What to do with Knol? 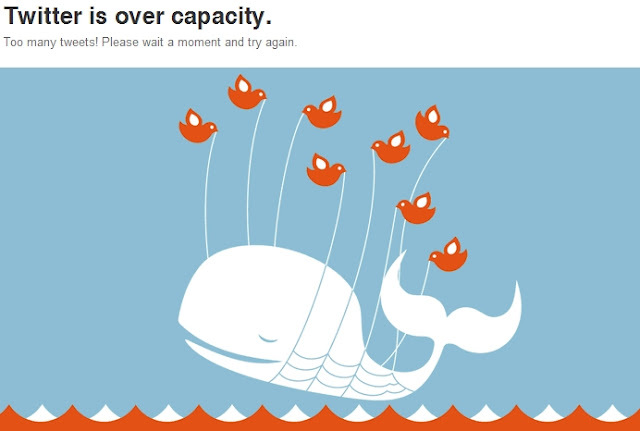 Just this afternoon, I tried to open my twitter account to see my latest twits and here's what I saw. Yes, worlds leading microblogging network hangs out because of heavy traffic. Twitter has proven itself as the fastest way of getting the latest news around the world. It's real-time microblogging capability has enabled many to send out news faster and in a more efficient manner than conventional methods. Now, twitter has grown so big, so as the twits that it carry. Social networking has changed the face of the internet. We getting deeper into the Information Age! 1. Transact only on your trusted web sites. 2. Look for valid web certificates. 4. Do not transact at pubic internet connections. 5. Have a good internet browser. I have here additional safety tips that can help you minimize the risk of being a victim of cyber crime. 1.Do not open attachments to emails that you do not expect. 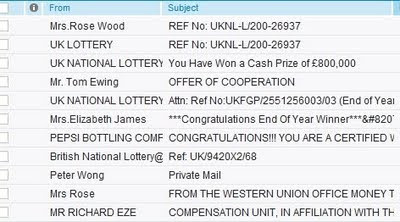 Sometimes, you may receive emails from a person you do not know and asks you to see the attached files. BEWARE of this! There is a big risk that these attachments contain malicious programs designed to harm you or your computer. Some malicious programs can steal your private information and use it to commit cyber crime. 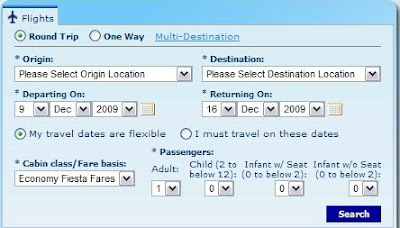 Image via Wikipedia Econolight is the cheapest seat Philippine Airlines (PAL) is selling. Some econolight seats can go down to as low as 800 pesos. Three days ago, I was surfing their website to look for promos for the coming holidays. Then I came across a very interesting announcement: Philippine airlines version of Cebu Pacific’s “Go Lite” has a very good update. I’m not sure when it was first announced, but it was good news to everyone who loves to fly on PAL. 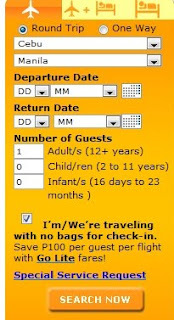 Effective for bookings made on or after November 18 and for those whose travel is on or after December 1, the following changes will take effect.